Use the form below to submit your paper for publication. Upload paper* (max 10mb, type: doc,docx,zip,rar) If your paper file is not being uploaded. Please upload a blank MS Word file and mail us your paper file. Note: Paper abstract and keywords will be extracted from your submitted document. No. of Authors* Enter the total number of Authors. Note: Details of co-authors will be asked only if and when paper is approved. Please wait while the paper is submitted for the publication process. It may take a while. Fast track Publication: This is for students who wish to get their paper published as soon as possible. Publishing before your deadline can be provided. 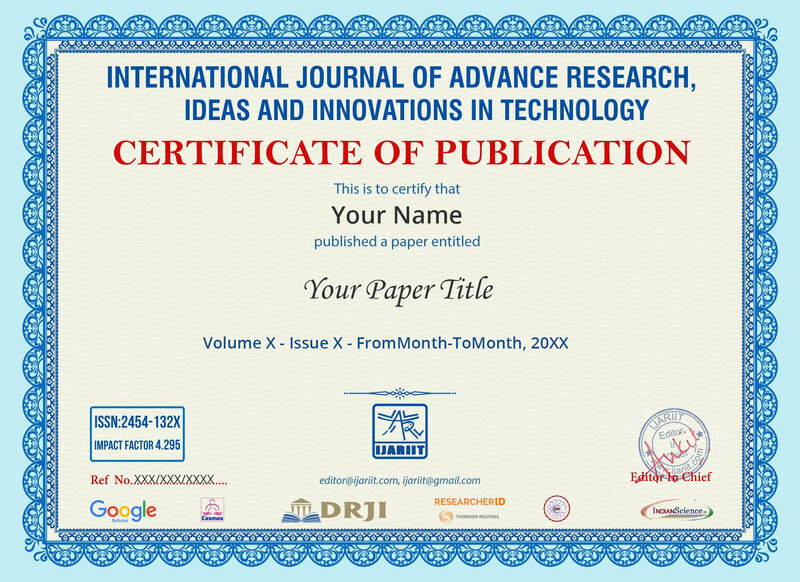 Open Access Journal: Every article published by IJARIIT is open to access and can be used by any researchers seeking academic support. Widely Indexed: IJARIIT is linked with various indexing platforms like Google scholar, Academia, Researcher id. High Impact factor: The impact factor of 4.295 is regarded to IJARIIT proving to be one of the best publishing journal in the country. Automatic Citations: After every paper is published, automated citations are available so that authors can get benefits whenever their papers are cited. Important: Once submitted to IJARIIT, you can not submit/present this paper anywhere else. Neither this paper will be withdrawn nor will be presentable in any other journal/conference/magazine or any media without the permission of the IJARIIT.